CEBU CITY - Former two division world champion turned promoter Gerry Peñalosa has initiated a grassroots boxing talent search here in the Philippines. Peñalosa, in partnership with ESPN 5, is currently holding tryouts for “THE NEXT BOXING SUPERSTAR”. It will be a tournament style format with eight boxers in every weight division. The participating boxers ideally should have at least ten bouts on their record. 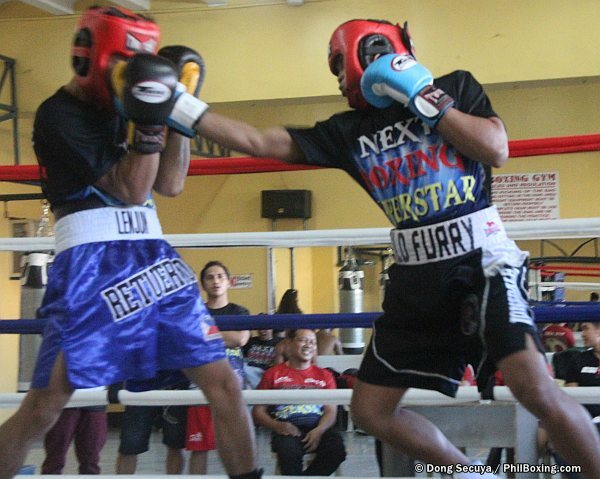 Peñalosa held auditions at the Cebu City Sports Center boxing gym Tuesday afternoon with participating boxers from various gyms in Cebu. He said that he will be travelling to Davao for the Mindanao tryouts and also for gyms in Metro Manila. 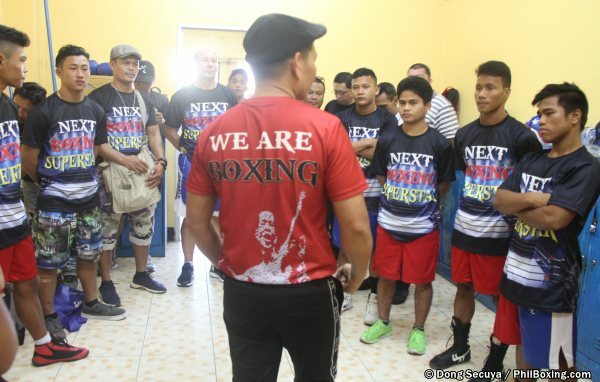 Former two-time world champion Gerry Peñalosa (back on camera) briefs the aspirant boxers about the objective of the search for the next boxing star project. Peñalosa, who heads Gerrypens Promotions, spoke to the boxers and shared with them his hardships when he was still and amateur and up and coming professional. He spoke about how he worked hard to mix school and training. Gerry Peñalosa poses with aspiring boxers during the Cebu leg of his search for new boxing stars at Cebu's Abellana Sports Complex. “Don’t waste your talent.” He advised the boxers. He told them that boxing icon Manny Pacquiao will also look at the films of the tryouts and give his input as to who will join the tournament. There will six flyweights and six bantamweights who joined the audition. They drew by lots their pairing and sparred for two rounds. The sparring session was taped for review and assessment. 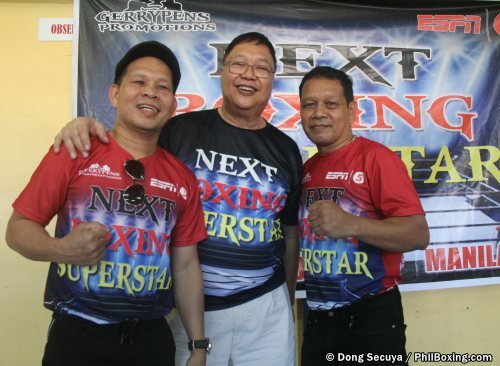 The Peñalosa brothers Gerry and former two-division champion Dodie Boy (R). The flyweights who tried out in Cebu were Jim Paul Dignos, Arian Melgo, John Paul Gabunilas, April Jay Abne, Rolly Durong and Eduardo Jimenez. The bantamweights were Rimon Rama, George Pasculado, Rafael Sueno, Kenan John Villaflor, Lenjun Retuerto and Braun James Wild. This tournament is a welcome development here in the Philippines where boxing maintains its popularity among fans buts suffers in terms of sponsorships. 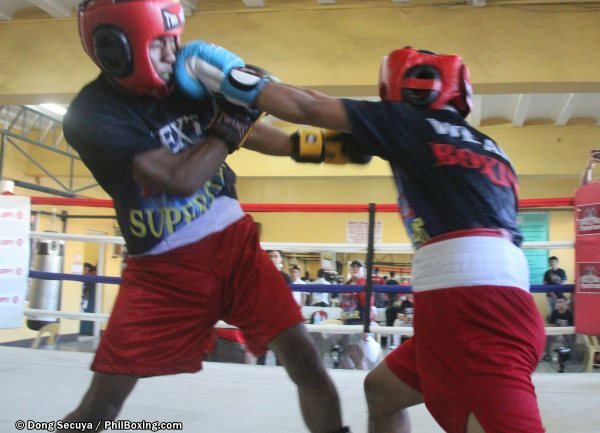 Eduardo Jimenez (L) connects with a left at Rolly Durong during their two-round sparring. Bryan James Wild (R) throws a right at Lenjun Retuerto during their sparring.